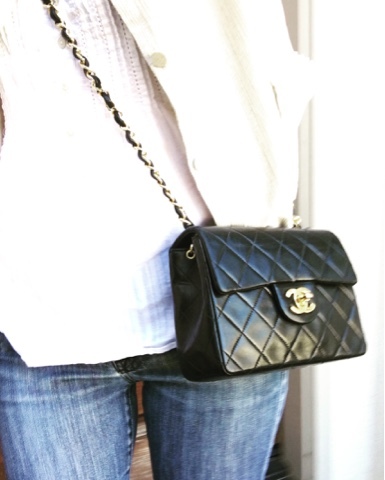 Savvy Mode: Chanel Flap: A Classic Investment??? Chanel Flap: A Classic Investment??? Looking around at all the bag prices, I am so glad I got some classics in the closet already. For this reason, hub is almost in tear with happiness. A few days ago I decided to ditch my usual mom tote and use a small shoulder instead. After I came home, I liked the small bag idea so much that I went to Chanel online to see if I could find another one. I didn't see any mini sizes but was shocked to see a small already priced at $4700. Even a tiny wallet on chain is around $2000. Wow! So this makes me think that perhaps all my classic bags are really great investments? With this in mind, I went online for fun to see the replacement cost of a mini flap. I found prices for a pre-owned bag from around $2000 to $3500 at Shopbop. I was so glee that I paid under $1000 for my bag. I just dated myself uh..... This mini flap is my very first Chanel. Up to this day, it is still my favorite, kinda like the first born idea! I made the point to hub that my classic bags are great investments. He asked if this bag will pay out dividend and when will I sell it to realize profit. Of course I can't sell my baby! But, if I ever want to purge my closet, I know for sure classic bags will hold more value than fun bags. So my mom is correct in teaching us to spend money on quality timeless pieces because in the long run we will get more utility. My bag purchases may not be great investments in the traditional financial sense, but these bags are nevertheless great investments because I still love each and everyone today as the first time I set my eyes on them. What about you, what is your first bag investment?